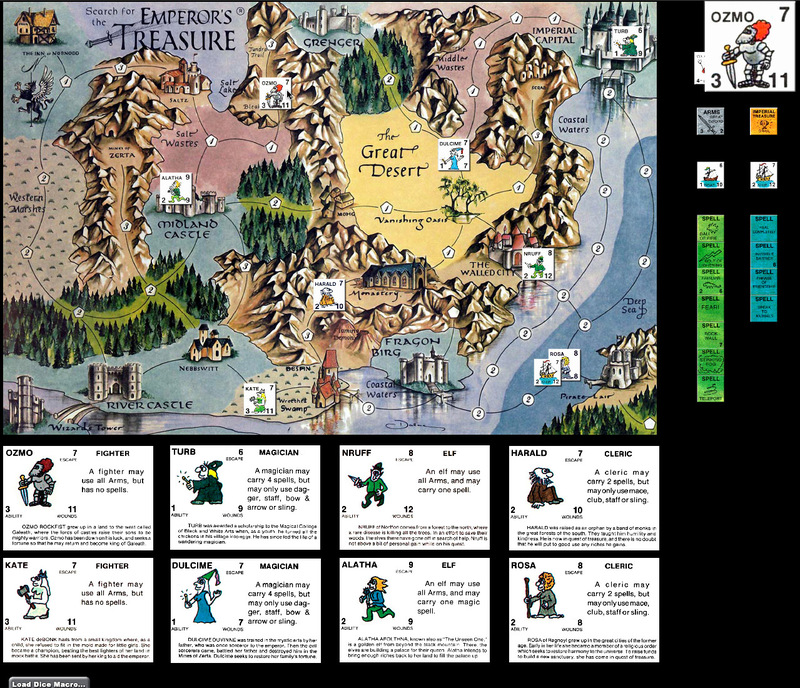 In this charming, tongue-in-cheek fantasy boardgame (often considered a boardgame version of “classic” Dungeons & Dragons), two to eight players take the role of a fighter, elf, cleric, or magician, then wander around the board collecting arms, treasure, and resolving encounters (which can be good or bad). The game ends when a certain number of Imperial Treasures has been found (depending on how many players are playing) at which point the player with the most treasures wins. Gameplay is competitive (half the fun is throwing nasty encounters on the other players). This game, designed by Tom Wham, was originally included in the center of issue #51 of Dragon magazine, in July of 1981, and is generally considered to be the best game ever published in Dragon magazine. In 1990, it was republished as part of a boxed set called “The Best of Dragon Magazine Games”. The game is republished here for use in BGE with the designer’s permission. Below is a screenshot of what the game looks like.